The modern world of art offers fascinating insights into the forces currently shaping world trade and the global economic system. For decades, China has experienced breakneck economic growth and has become a world leader in both the consumption and production of art, which illustrates some intriguing changes in the global economy. The global market for high-end, rare art pieces is a good example. In recent years, as China grew more prosperous, there has been a sharp uptick in luxury art purchases by Chinese customers. In 2016, according to insider information, Oprah Winfrey sold a 54”x54” painting to a Chinese collector for $150 million. This example indicates how China has grown in its appreciation of originals. This shift perhaps presages an eventual reduction in counterfeit products for which China is still infamous. Chinese auction houses have also risen to prominence. Of the world’s top ten art auction houses, six are Chinese, and many of the largest art houses are state-owned enterprises. In the art world, China has not only become a dramatic consumer of art, but also a prodigious producer. 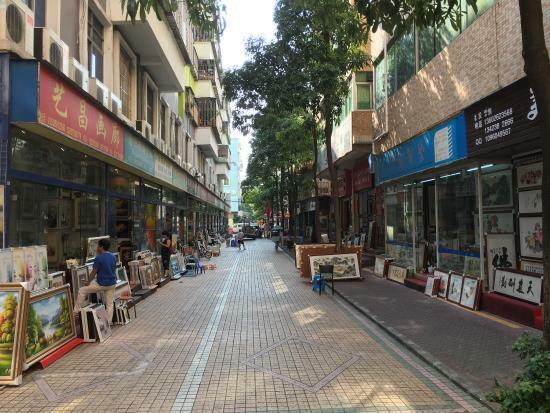 The southern Chinese city of Dafen, nearby to megacity Shenzhen which borders Hong Kong, has become the center of knock off art masterpieces. Beginning in the 1980’s reform era, Dafen became a hub for starving artists from around the country to work and train, pumping out high-quality knock-offs of famous European and American painters ranging from van Gogh’s Sunflowers to portraits of Western icon John Wayne. Artists produce these works on the cheap and can offer custom alterations, such as changes to the color or size to fit the purchaser’s own décor. Since the works are not signed, they do not count as fakes.